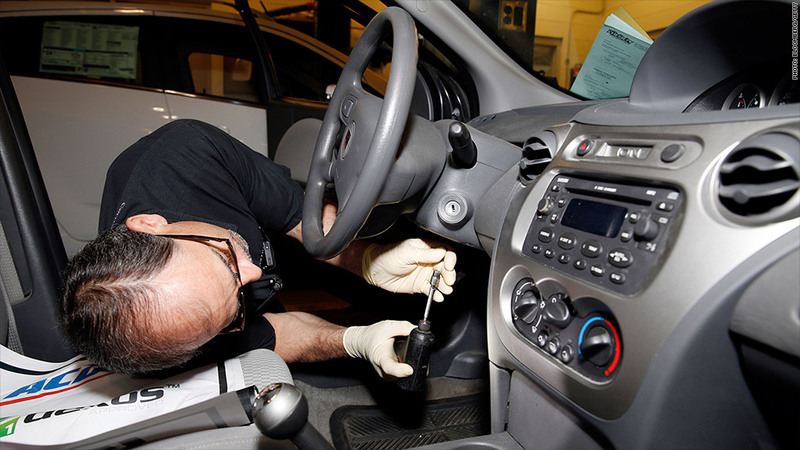 A GM mechanic fixes the faulty ignition switch on a Saturn Ion. More than 1 million General Motor cars with a defect tied to at least 23 deaths are still on the road today. The automaker has fixed just over 1 million cars recalled for a faulty ignition switch that can cause the car to shut off while being driven, disabling the air bags, anti-lock brakes and power steering. That's about 48.5% of the 2.4 million recalled cars that are still on the road, GM says. The recall was first announced in February but repairs didn't start until April, because it took a while for for GM supplier Delphi to ship the replacement parts. "Fixing more than 1.1 million vehicles in [six months] is a Herculean accomplishment for the supplier making the parts, the logistics people getting them to dealers and dealers fixing vehicles," said GM spokesman Alan Adler. The last of the replacement parts are being delivered to GM dealerships this month. But a significant number of recalled cars are actually never repaired. GM's records show that 80% of cars it has recalled are repaired within a year of the notice, and 85% within two years. Indeed, only 52% of Ford Pintos recalled in 1978 for the dire problem of exploding gas tanks were brought in for free repairs. About two-thirds of recalled cars are repaired accross the auto industry as a whole. Car owners often ignore recall notices, thinking they are junk mail. GM has made an extra effort to contact owners in this case. And this recall has attracted significant news coverage and spurred several congressional hearings. "You'd have to be living under a rock to not know about the recall. But often consumers become numb to recalls," said Mike Rozembajgier, vice president Stericycle, a firm that helps automakers manage recalls. One way to get more cars repaired is to require that all recalls are addressed before a vehicle can pass state inspection, says Clarence Ditow, executive director of the Center for Auto Safety. He also thinks that it should be illegal to transfer any car's title without recall repairs being fixed. Rozembajgier said that even with so many news reports, some owners might not realize their models are included in the recall, since the Chevrolet Cobalt and Saturn Ion got most of the attention. Other models affected include the Pontiac G5, Soltice and Pursuit, the Saturn Sky and the Chevy HHR, as well as some Vauxhaull, Daewoo and Opel models sold overseas. GM has made loaner cars available to owners who don't want to drive their recalled vehicles. It also advised drivers to remove other keys from their key ring, which it said would eliminate the chance the ignition would switch into the "accessory" position and shut off the car accidentally. Some safety advocates have questioned that claim by the automaker. There has been at least one fatal accident involving a recalled car since the recall was announced. Lara Gass, 27, was killed in an accident on Interstate 81 in Virginia on March 18 when her Saturn crashed into a tractor trailer on a snowy road. The fire that consumed the car made it impossible to know how many keys were on her key ring, according to the state police.